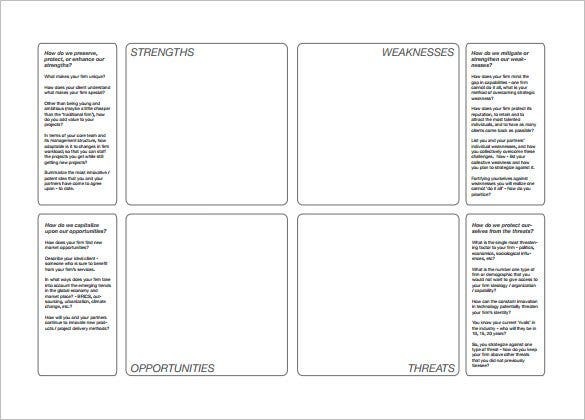 A SWOT analysis template is the most needed before you start your new venture or release a new product in the market. 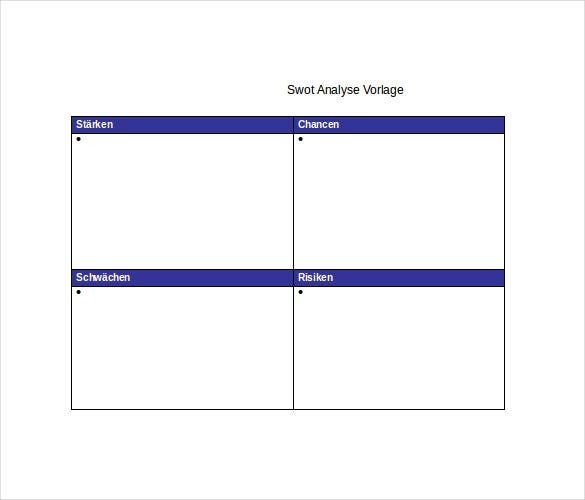 The analysis system gives an overall notion about the negative & positive aspects of your new launch so that you can weigh the opportunities and threats before the plunge. 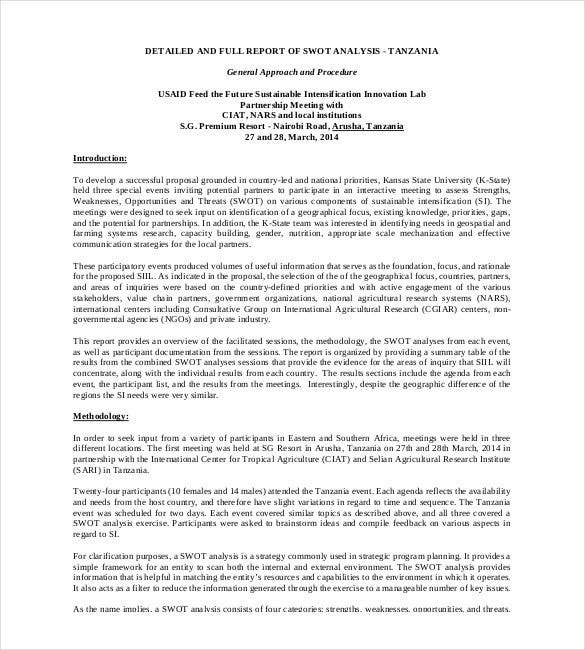 It will help to decide whether at all you would want to launch the venture or not. 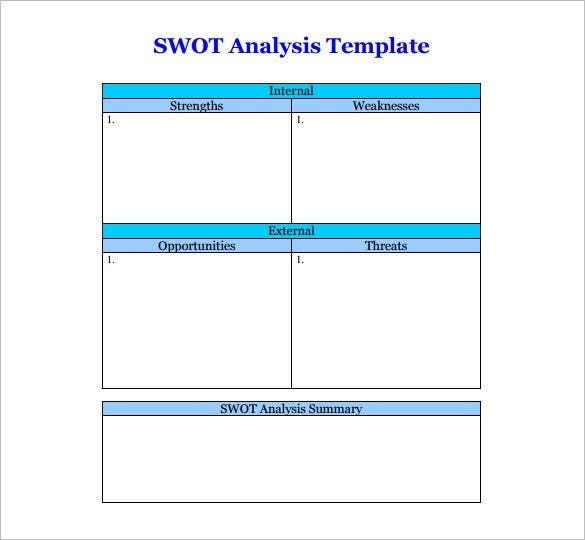 A SWOT Analysis Templates sample will help you to design your OWN SWOT analysis. 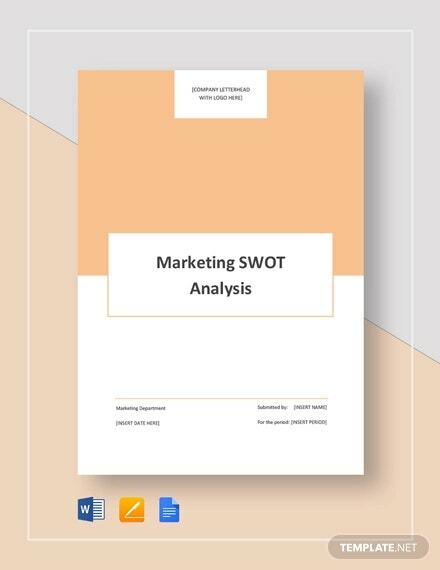 If you are planning to start working on a new service or product, you should make sure to get a SWOT analysis on the project first to understand the risks and benefits associated with the project. 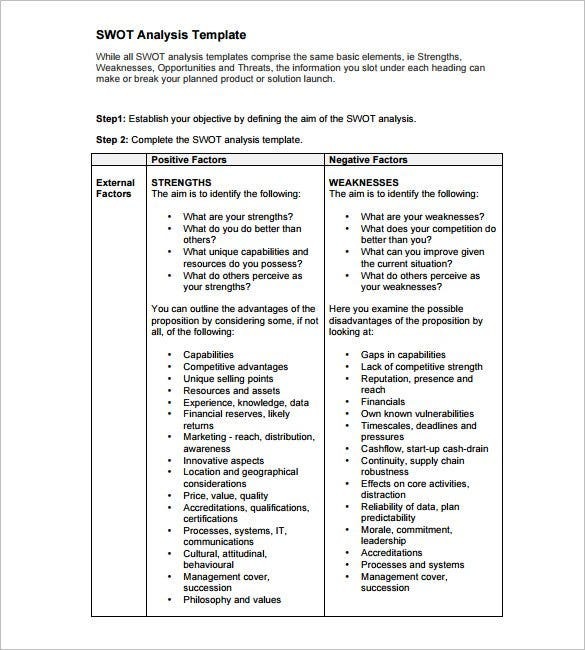 In case you need ideas on creating a perfect SWOT analysis, SWOT Analysis Templates in Word example will be helpful for you. 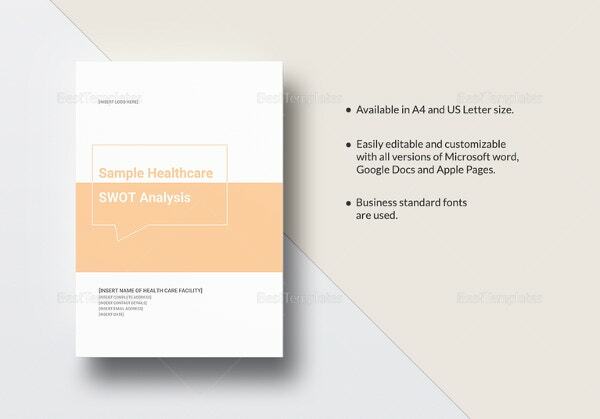 Every business, regardless of size, should carry on a Microsoft Word SWOT Analysis Templates prior to plunging into a new project or taking up a new step. 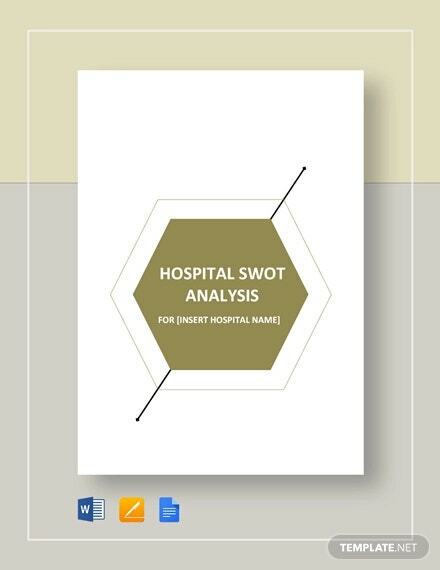 A free swot analysis template word doc will identify both the hindrances & opportunities associated with the proposed project so that one can take an informed decision. 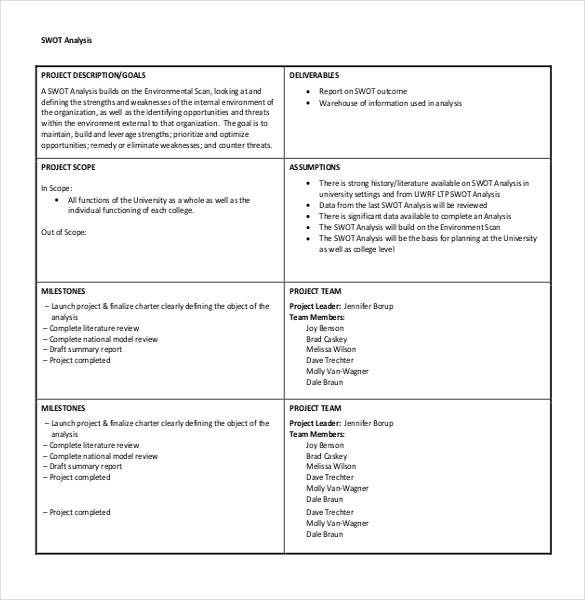 Are you about to initiate a new project with your office team? 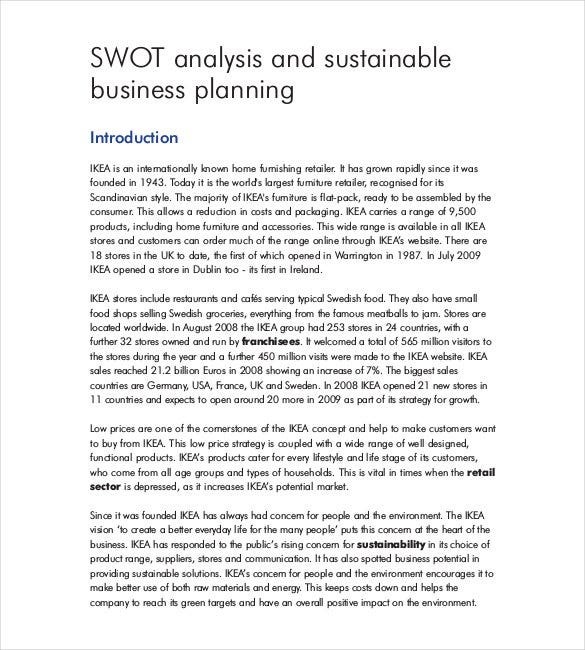 Well, you certainly don’t want to come up with a futile venture and hence it’s very important to weigh up the pros and cons of the project prior to launch with the help of a SWOT Analysis template excel sample. 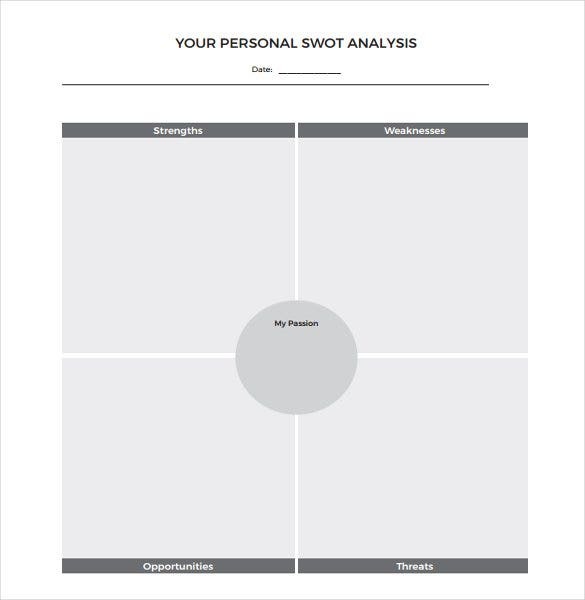 Though SWOT analysis is especially used for business projects, yet you can also use a personal swot analysis template word doc – to assess your strength and weaknesses in your personal life. 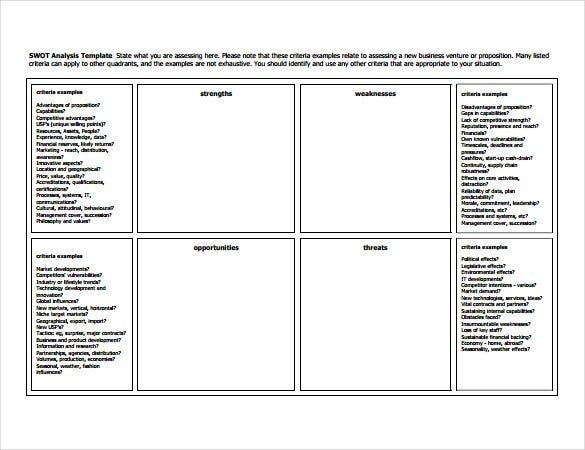 This will help you to understand your strengths and also which of your traits or skills need a better polish. 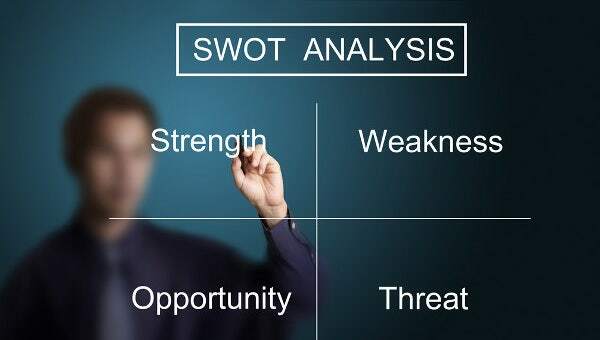 SWOT analysis refers to taking a closer look at Strength, Weakness, Opportunities and Threats of any new project that you are going to start. 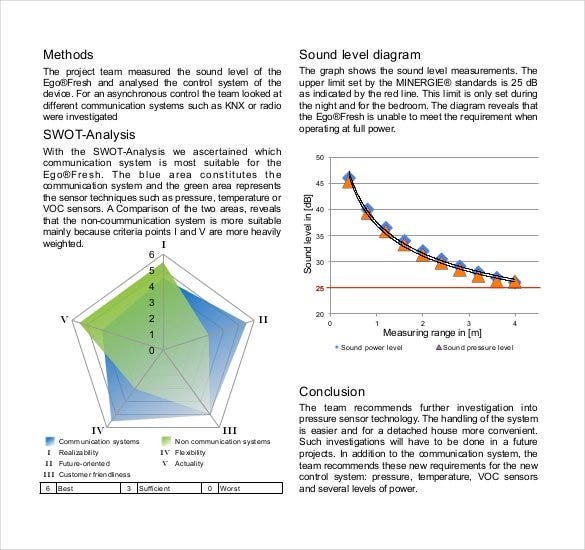 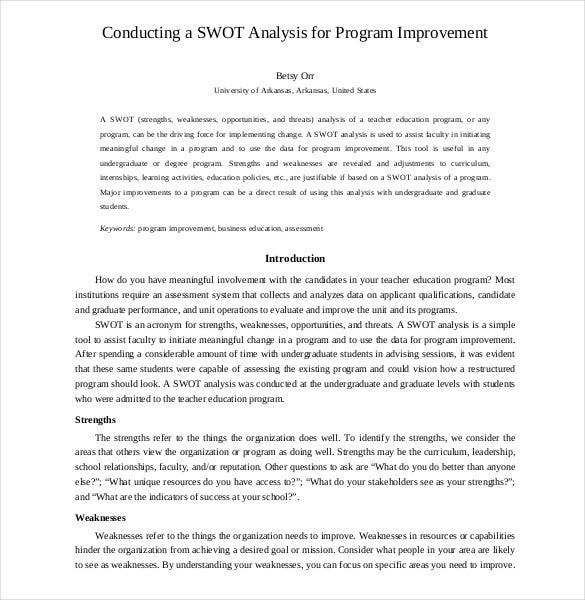 The analysis helps you to come up with an informed decision of the project and the swot analysis samples word doc will be really helpful here. 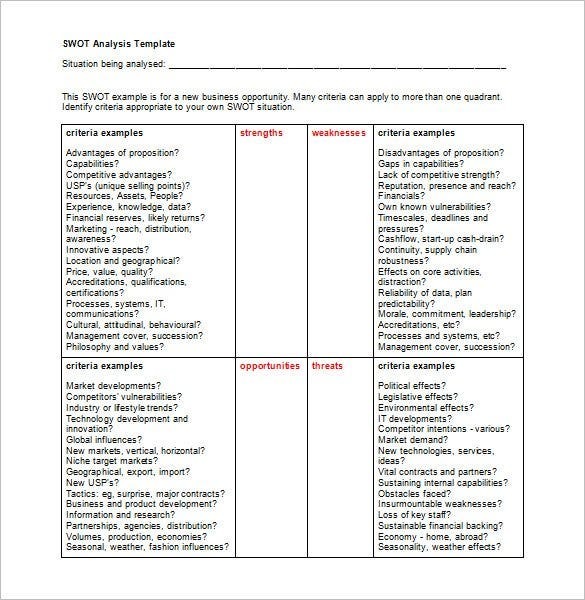 A blank swot analysis template sample can come in word doc or PPT or Excel. 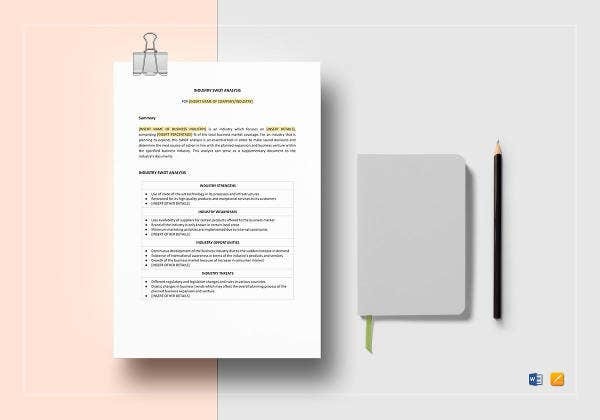 It helps you to identify the risks and chances associated with your new project so that you can prepare your project in a better way- to avoid the possible negative consequences as detected by the SWOT analysis. 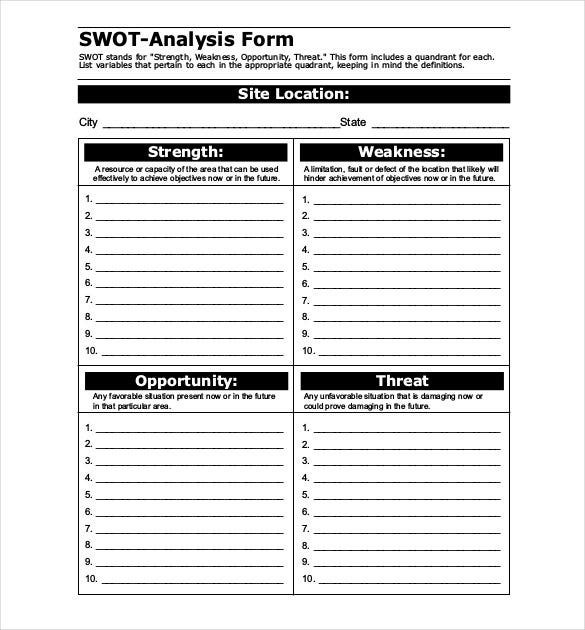 Are you about to start a project and need to run a SWOT analysis on it? 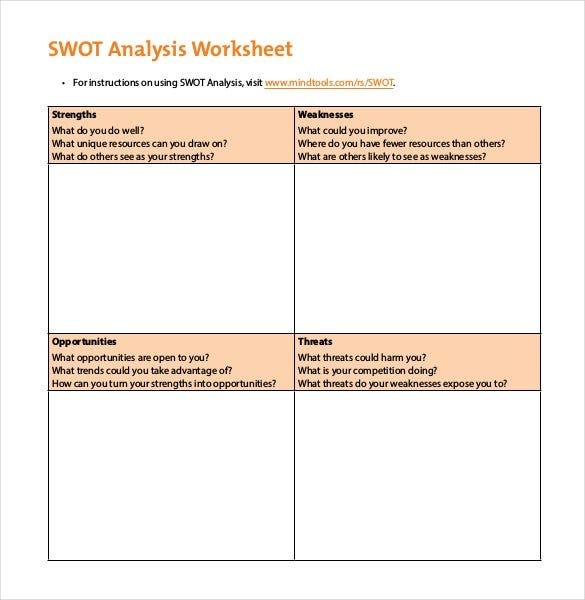 Well, in case you need ideas on how to draft a SWOT analysis or have no time to create it from scratch, the smarter route is to take to a template for swot analysis example. 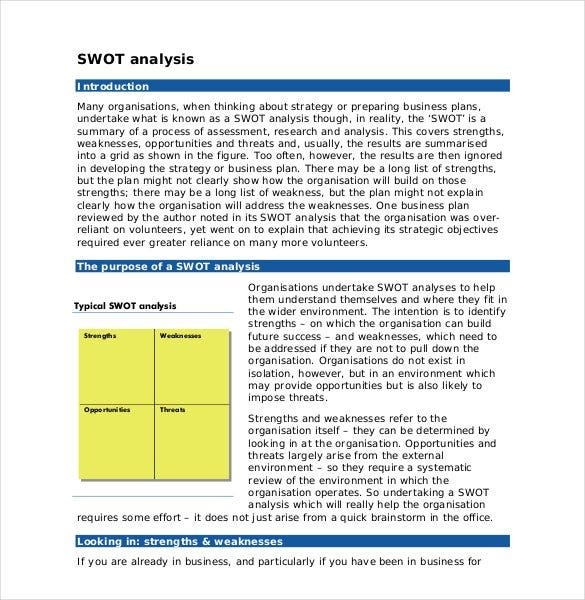 Though a lot of entrepreneurs discard the SWOT analysis stating a waste of time, yet such an analysis is absolutely important before taking a new step. 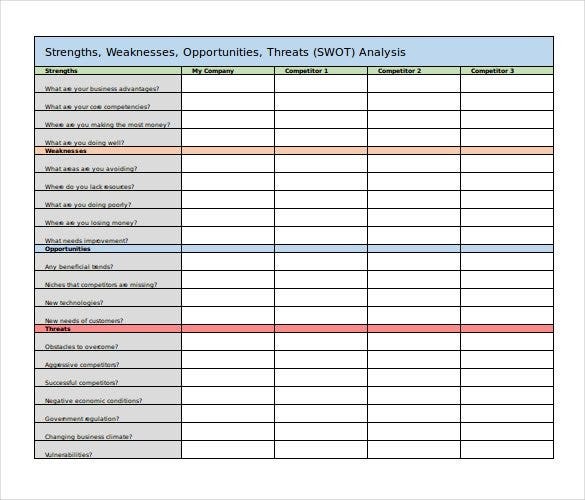 A business swot analysis template word doc or Excel will help you to identify the possible pros and cons of launching your new project so that you can take better decisions. 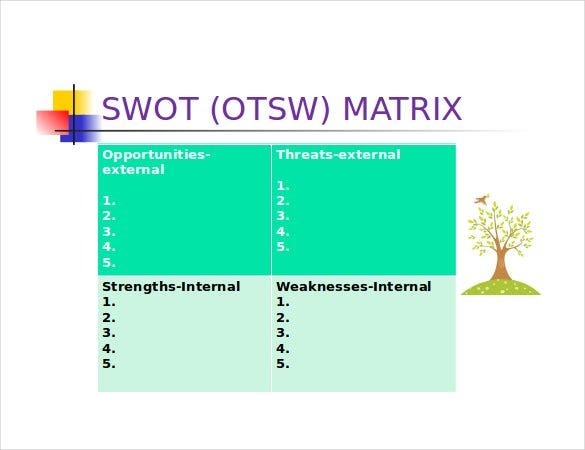 The swot analysis examples sample helps one to identify Strength, Weakness, Opportunities and Threats of any new project he is going to start. 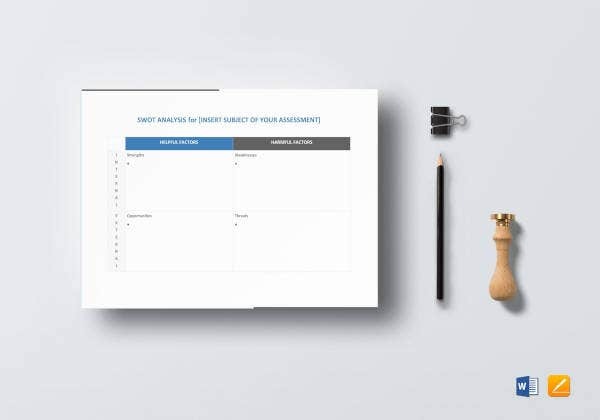 It enables you to explore ideal avenues for your initiative, make informed decisions about your strategies, identify areas for needed change as well as refine & redirect the efforts midplan. 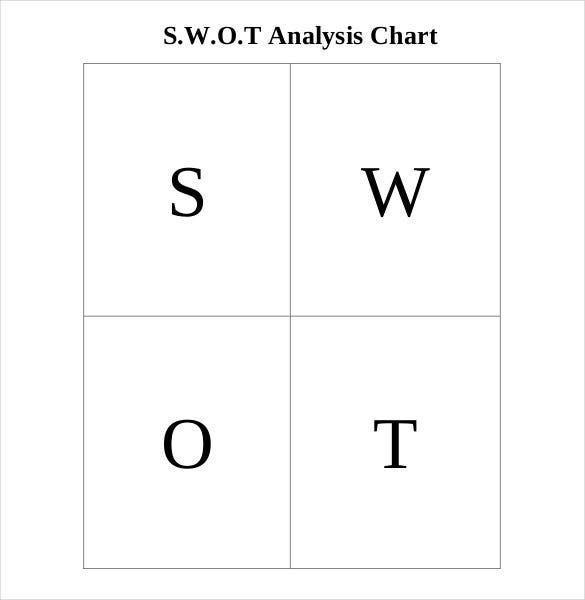 A company should follow a company SWOT Analysis Sample before any new venture, be it a product or launch or a venture into a new territory. 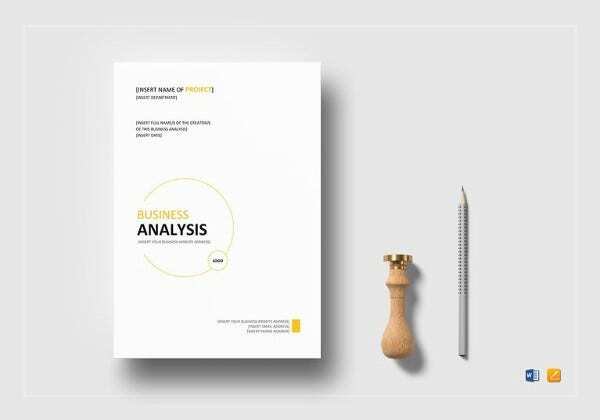 Every new step has its own set of pros and cons and the analysis will enable the company to understand the ratio of positive & negative consequences so that it can define its strategies accordingly. 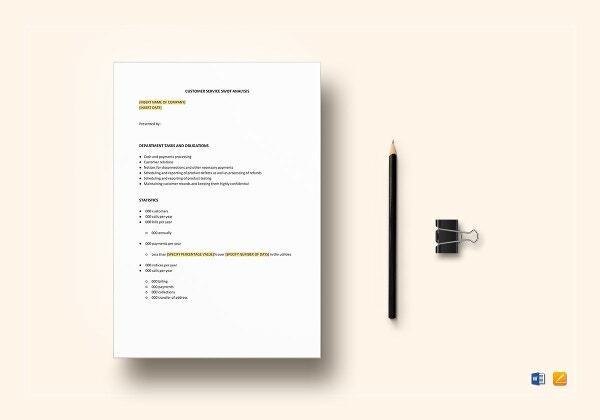 A good and effective marketing campaign of any business must not take place without meticulous research and planning. 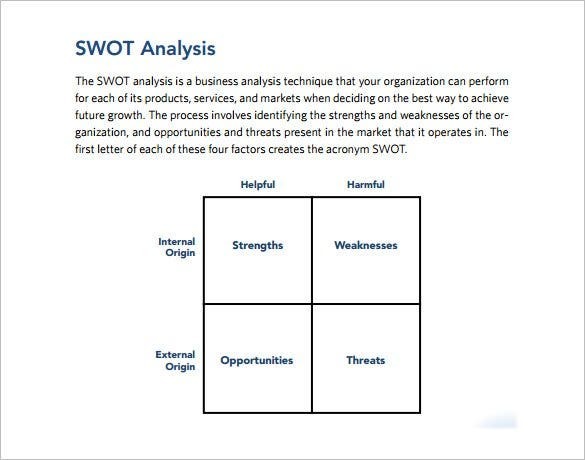 In order to do a breakout marketing campaign for any product or service, it important that its SWOT analysis be done. 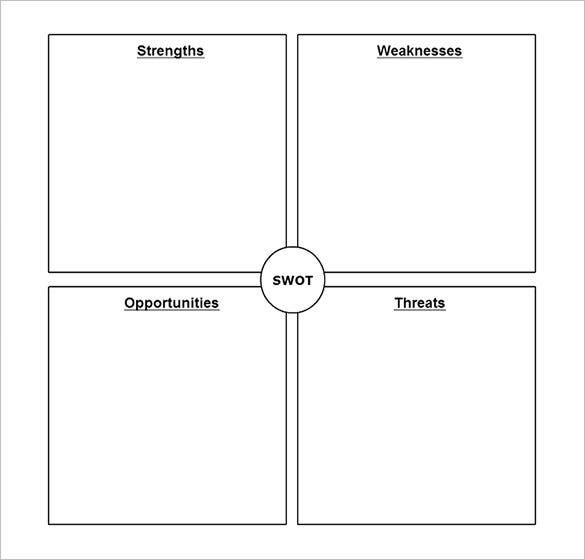 SWOT stands for Strength, Weakness, Opportunities and Threats. 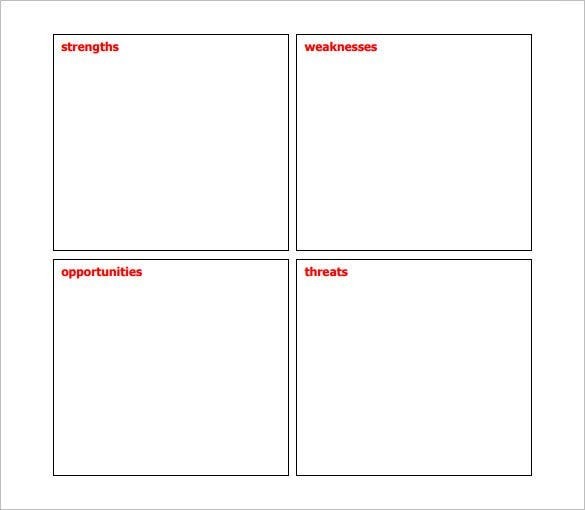 All four are biggest determinants of marketing campaign’s success or failure. 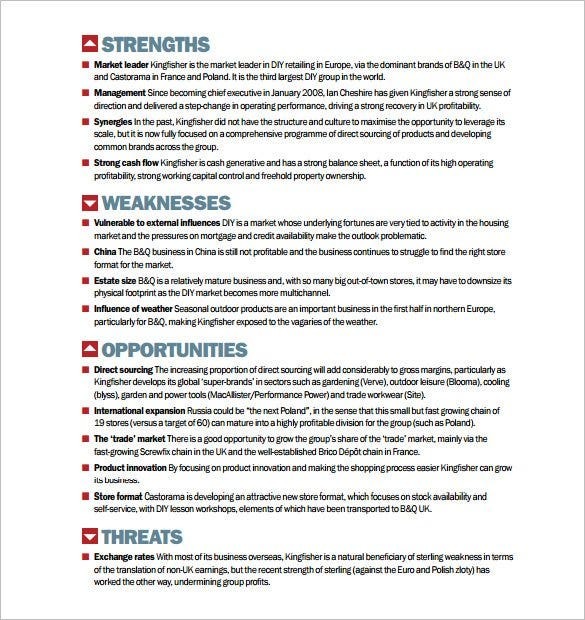 Readymade SWOT analysis are gettable on the Internet, we have compiled a selection of some right here. 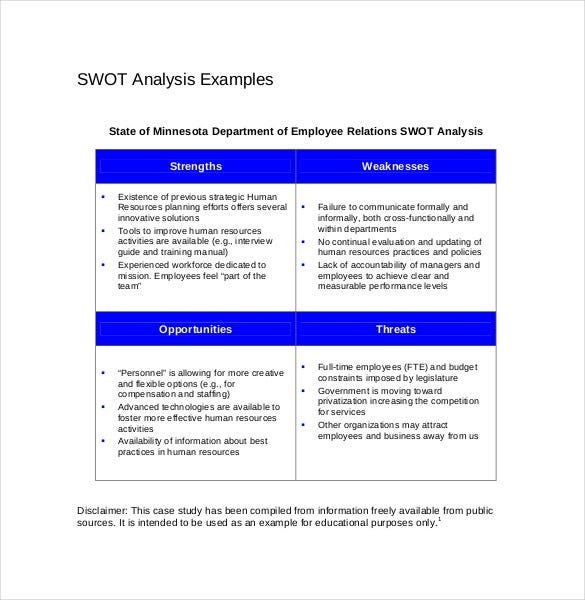 Though primarily associated with company projects, yet SWOT analysis can also be used in other areas of life, such as churches. 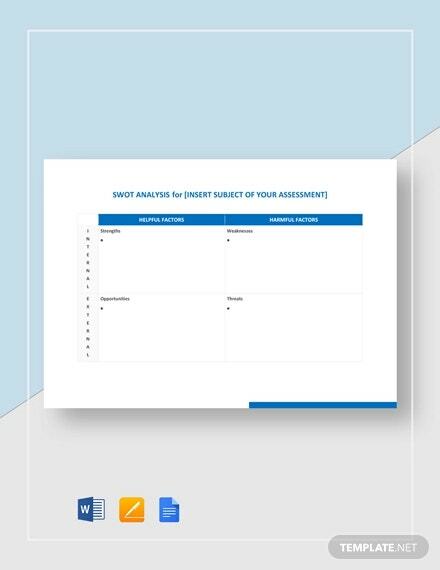 You will find swot analysis template for churches sample today that will enable you to evaluate the effectiveness & weaknesses of the existent or alternate & new church programs. 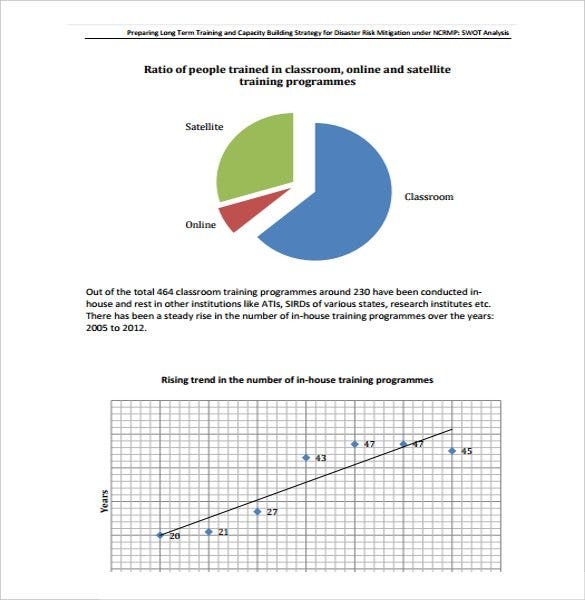 Akin to businesses, schools too need to evaluate the positive and negative impacts of their teaching styles and new courses to understand their efficiency and value in the market. 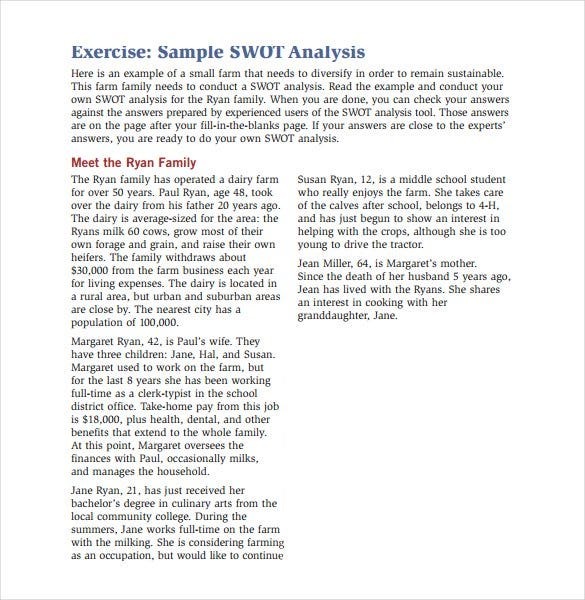 A SWOT Analysis Templates in Word for schools example will allow the school to have an informed understanding about its strong points and areas of change or improvement. 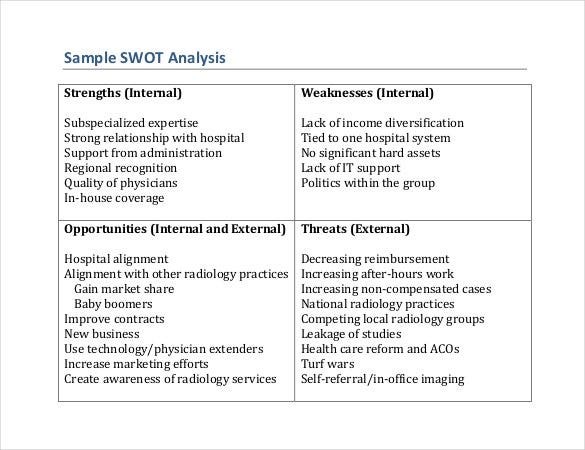 Colleges and universities must take to SWOT Analysis Examples higher education sample before introducing a new course to the students. 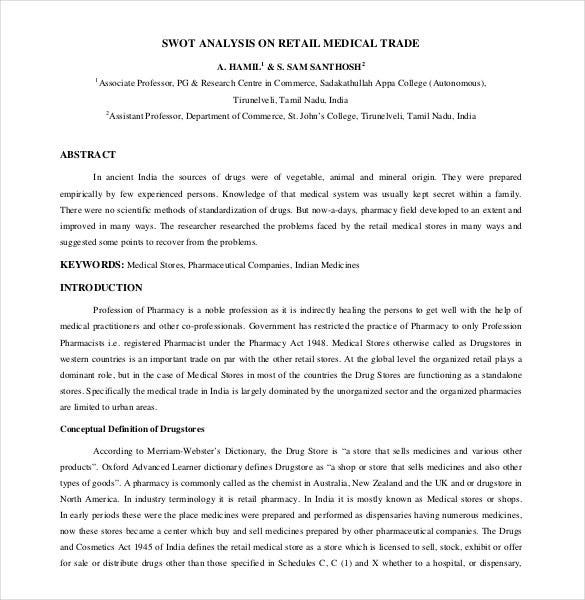 The course will help them to have a fair view on the prospects and the market value of the course and also how much the institution itself is equipped to run it. 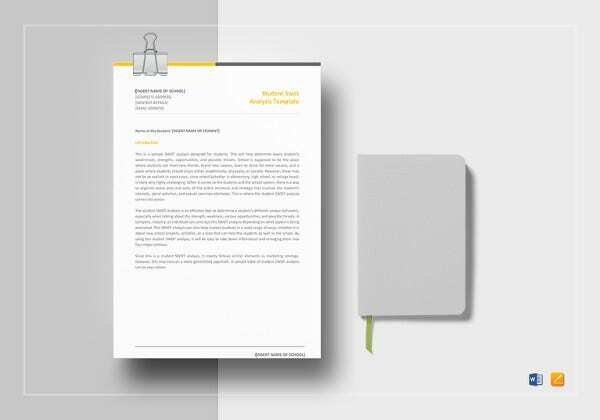 Are you about to launch a new training program in your institution? 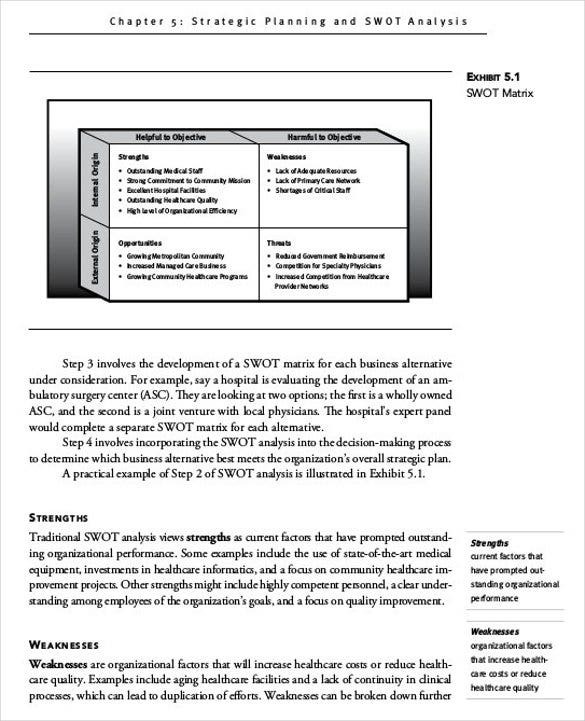 Well, before you launch it, it would be wiser to follow a training swot analysis template example so that you can be aware of your capabilities as well as the areas of improvement needed to run the course successfully. 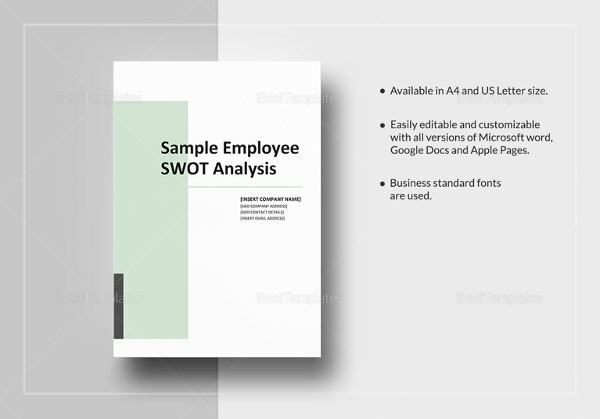 Whether you want employee SWOT analysis templates or Project Management SWOT Analysis Templates- there are professionally designed readymade and easily customizable online templates to save you from all the hard work of creating the whole draft all by yourself.